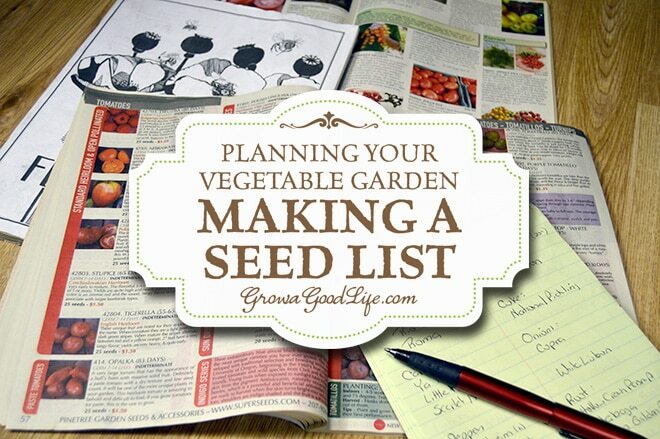 Organizing your seeds is a big step towards planning your vegetable garden. Having your seeds in order will make it easier to figure out what you have on hand and what you need to purchase. 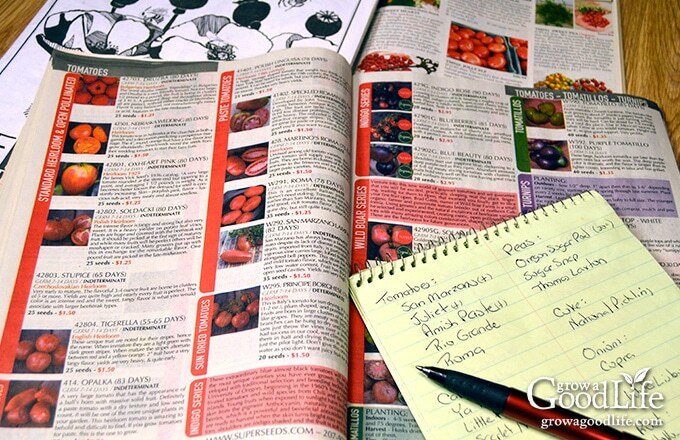 There is nothing more exciting to a gardener than planning the next growing season. Even though it is cold outside, my heart warms at the thought of planning the garden, starting seeds under my DIY Grow Light System, and digging in the dirt even on a small scale. I enjoy paging through the seed catalogs and marking the things that interest me. This usually results in more crops than I could ever grow in a lifetime, so the process of trimming down the list to more realistic goals begins. Before I can do any garden planning, I need to get my seed collection in order, decide what I want to grow this year, make a seed list, and order seeds. Here is my yearly routine for making a seed list and some tips I have learned along the way. 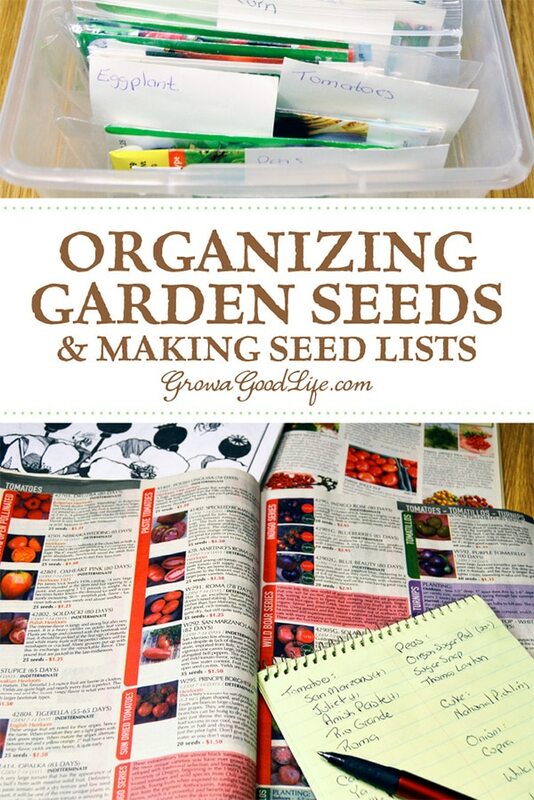 If you are like me and are eager to kick off your gardening season, you probably have a list of things you want to grow or maybe even a pile of seed packages that you have acquired over the past year. It’s is time to get things organized and take inventory so you know what you have on hand and what you need to purchase. I store my seeds in two shoebox sized totes. The seed boxes are divided into sections (i.e. tomatoes, peppers, onions, lettuce, squash, etc.) with index cards and labeled. Each seed package is kept in a zipper bag to keep it dry. Most seeds will keep for a number of years when stored in a cool, dry location. Most seeds will keep for a number of years when stored in a cool, dry location. The seeds will have a reduced germination rate the older they are. Fedco’s Seed Viability Chart will give you a general idea how long seeds will last. Before you throw older seed packages away, try this Simple Seed Germination Test to see if your seeds will sprout for you. I organize the seed boxes by filing the seed packages into the correct sections. Once this is complete, I spread out each group on the table like playing cards. I review the packages to see how many seeds they contain, check the dates, and decide what I want to grow. Think about the types of vegetables you like to eat as you flip through the pages of your seed catalogs and look through your inventory of seeds. If you love salads, then tomatoes, greens, and lettuce would be obvious choices to grow in your garden. If you enjoy fresh salsa, then peppers, onions, tomatoes, and cilantro should be on your list. Herbs are very beautiful and add a pop of flavor to your cooking so tucking a few plants into your garden is also a good idea. Targeting your objectives will help you choose vegetables that will make the most of your garden. I usually begin with the tomato category because tomatoes are an important staple in my garden. We enjoy them fresh during the growing season, but the bulk of tomatoes grown are made into jarred sauce and salsa that we enjoy all year long. I rely heavily on paste-type tomatoes such as San Marzano, Roma, Amish Paste, and Juliet. So it is important to have enough fresh seeds on hand. I spread the tomato seed packages out in front of me and check the dates and make sure I have enough inventory of fresh seeds for the season. Each tomato type I want to grow is added to a list. I keep two lists going as I move from section to section of my seed box. One is a list of the varieties of each category that I would like to grow; the other is a list of seeds I need to purchase. 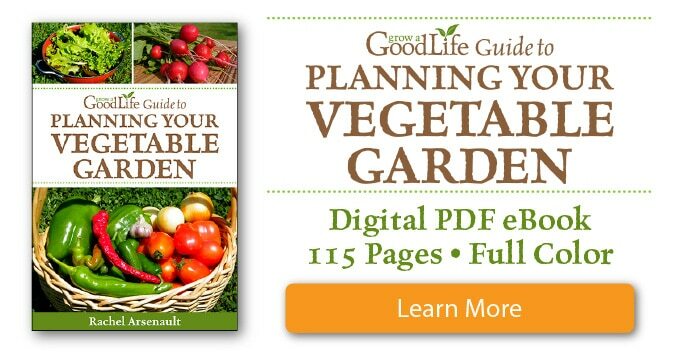 Winter is the perfect time to plan your vegetable garden. Start by organizing your seeds so you can take inventory, test older seeds for germination, make a list of seeds to purchase, and place your seed order. Once spring comes there is so much to do. 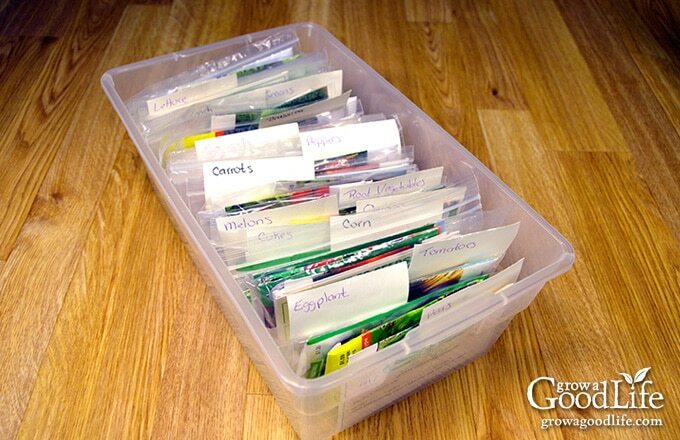 It is helpful to have your seed inventory ready when it is time to plant them. 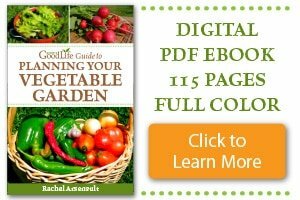 The next steps in Planning Your Vegetable Garden is Mapping the Garden Beds to help you figure out how many transplants to grow, and setting up a Seed Starting Schedule so you know when to start your seeds. Great post! I need to get my ideas down on paper. I am so excited to start planning my garden for the year, I just never seem to be organized enough. Thanks for the tips! Thanks for linking up with Green Thumb Thursday. I’ve chosen this post as my featured post this week! Please stop by and grab a ‘I was featured’ badge for your blog. I hope you’ll join us again this week! What a great way to spend a winter’s day! 🙂 Thanks so much for linking up to Awesome Life Friday! We’ll be pinning this – we’re looking forward to seeing what you have to share this week! I really need to get my gardening supplies more organized. Last year was construction year, building the greenhouse, and putting in the garden. This year I will be more organized! Thanks for posting at the Homestead Blog Hop! Rachel, The days are getting longer and you are planning your garden. Spring must be just over the horizon! We have been keeping a seed list for about five years now and it has been a great resource to us every year. At the end of the growing season we make a note what did well and what our yield was. We can base our new planting season on what has worked for us in the past. My wife gardens at our cabin. Most of what she plants is directly seeded in the ground. I know she would like a greenhouse for starting plants and extending the growing year, but where we live wind is too much of a problem for one. It’s never to early to plan for success. Thanks for showing how you organize and prepare for spring planting. I am also eager to get planting after the winter too – I love how organised you are! I have my seeds sorted into groups by expiry year, and then alphabetically. Kyra, It sounds like you have a good seed organizing system in place. I am really bad about tossing older seeds. I need a much better way of organizing my seeds, at the moment, they are just stuffed inside a canvas bag. I like your setup. Kind of reminds me of the old card catalogs. Thankfully, I won’t have to buy much seed this year as I still have a ton from last year and was pretty good about saving seed. Thomas, I’ve been using this seed storage method for a while now. It works and keeps me organized. Most of ours have arrived and have created a scary pile but we know all the resulting plants will find a home. Sue, I have a good size list of seeds to order this year. I may need another box for storage especially for the larger seeds, like beans. I make my seed list on the spreadsheet program on my computer. I list kind, variety, company, size, year purchased, then have space to write in comments. Then I make a paper copy to have with the seed bins.